A new Sentinel for Liberators appears, that generically supports Gold Paladins. AUTO: [Choose 1 card from your hand, Discard it] When this card is placed on (GC) from the hand, you can pay the cost. If you pay it, choose 1 of your Units, during that battle, it cannot be hit. ACT (Drop Zone): [Choose 1 card with the same name as this card in your Drop Zone, Bind them face-up] Choose 2 cards on your Circles other than the (VC), place them on the bottom of your Deck in any order, if one or more is placed, look at the top 3 cards of your Deck, Call 1 of them to (RC), and place the other 2 on the bottom of your Deck in any order. For Today’s Card, we’re introducing a card from the 13th Booster “Ultimate Stride” (on sale Friday November 17th, 2017), the 《Gold Paladin》 【Sentinel】, “Liberator, Improve Falcon”. “Liberator, Improve Falcon” has a Skill to return cards on circles to the Deck and then Call a new Unit. 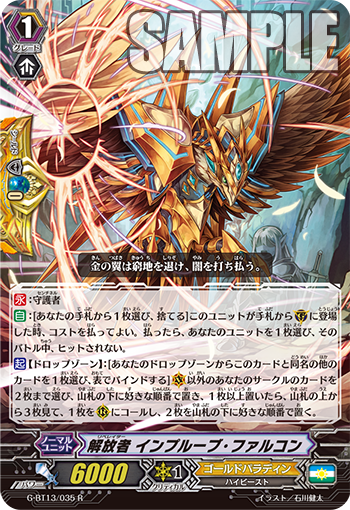 In addition to the standard Perfect Guard against opponent’s attacks that is the par for course Skill of 【Sentinel】s, it also has a Drop Zone Act ability that if you Bind another “Liberator, Improve Falcon”, you can return up to 2 cards on circles other than the Vanguard Circle to the Deck,then if you returned 1 or more, you can look at the top 3 cards of your Deck, and Call 1 of them to a Rear-guard Circle! This skill can even return Locked cards to the Deck. Also, it’s a handy skill for satisfying the conditions of “When this card is placed on the field from the Deck” Skills of “Liberator” Units. This 【Sentinel】 is sure to strengthen 《Gold Paladin》 Decks!